Alexander III, given name Orlando Bandinelli, Roman Catholic Pope from 1159 to 1181, was a Siennese, and as a teacher of canon law in Bologna composed the Stroma or Summa Magistri Rolandi, one of the earliest commentaries on the Decretum Gratiani. In October 1150 Eugenius III created a cardinal deacon of SS. Cosmae and Damiani; later he became cardinal priest of St. Mark's. Probably about this time he composed his Sentences, based on the Introductio ad theologiam of Peter Abelard. In 1153 he became papal chancellor, and was the leader of the cardinals opposed to Frederick Barbarossa. On the 7th of September 1159 he was chosen the successor of Pope Adrian IV, a minority of the cardinals, however, electing the cardinal priest Octavian, who assumed the name of Victor IV. This antipope, and his successors Paschal III (1164-68) and Calixtus III (1168-78), had the imperial support; but after the defeat of Legnano, Barbarossa finally (in the peace of Venice, 1177) recognized Alexander as pope. On the 12th of March 1178 Alexander returned to Rome, where he had been compelled to leave twice, namely, from 1162 until the 23rd of November 1165, and again in 1167. The first period he spent in France, the latter chiefly in Gaeta, Benevento, Anagni and Venice. 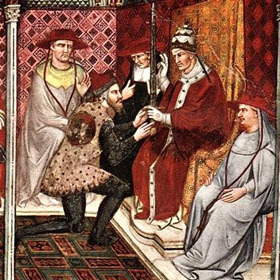 In March 1179 Alexander held the third Lateran synod, a brilliant assemblage, reckoned by the Roman church as the eleventh oecumenical council; its acts embody several of the pope's proposals for the betterment of the condition of the church, among them the present law requiring that no one may be elected pope without the votes of two-thirds of the College of Cardinals (repealed by Pope John Paul II.) This synod marks the summit of Alexander's power. Besides checkmating Barbarossa, he had humbled King Henry II of England in the affair of Thomas Becket, he had confirmed the right of Alphonso I of Portugal to the crown, and even as a fugitive had enjoyed the favor and protection of Louis VII of France. Nevertheless, soon after the close of the synod the Roman republic forced Alexander to leave the city, which he never re-entered; and on the 29th of September 1179 some nobles set up the Antipope Innocent III. By the judicious use of money, however, Alexander got him into his power, so that he was deposed in January 1180. In 1181 Alexander excommunicated William the Lion of Scotland and put the kingdom under the interdict. The great pope died at Civita Castellana on the 30th of August 1181.